Should Milwaukee create an "adult entertainment district"? A couple of years ago, singer-songwriter Hugh Masterson left Milwaukee with his sights set on Nashville. While his hope that the rest of his former band, the Hustle, would join him there hasn’t materialized, Masterson hasn’t let that deter him. Instead, he’s stayed busy uncovering his own musical identity and selecting musicians to write and record music with. Since relocating, Masterson has played shows around the country under his own name, and shared the stage with artists like Margo Price, Nikki Lane, the Lone Bellow, and Anderson East. 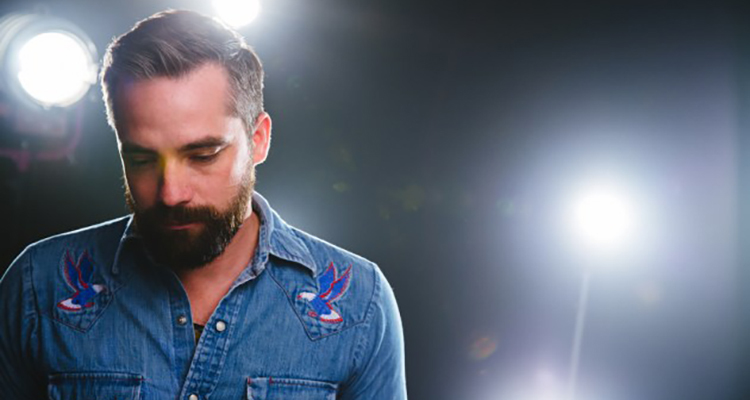 His recent touring band featured members of the Lone Bellow (Brian Elmquist and Justin Glasco), Phosphorescent (Chris Marine), and Wheeler Walker Jr. (Jeff Malinowski). Perhaps most importantly, Masterson has new music to release. He will put out his latest EP, Lost + Found, this Friday. The EP features Hustle members Quinn Scharber, Bradley Kruse, Nicholas Ziemann, and Justin Krol. Masterson recorded and co-produced the EP with Bill Skibbe, best known for engineering albums from bands like The Black Keys and Dead Weather at Benton Harbor, Michigan-based Key Club Recording Co.
Milwaukee Record: How does it feel to be finally releasing your EP? Hugh Masterson: It feels good. It’s been a long time coming, as you know. I just wanted to find a home for it so I can distribute it and get it out to more people than just putting it out by myself. After I moved down here and the band didn’t come down, it just took me a while to reevaluate and situate and feel comfortable in my new city and my new home. And finding new work. Life sometimes takes over and you have to recalibrate. So it feels really good. We just went out—the people that played with me—and played some shows in Wisconsin and Louisville, and it was really fun to be playing with a band on stage again. The last tours I’ve done were solo tours with Margo Price and Lone Bellow and Anderson East. Those are big stages and you’re just one person up there. So it definitely feels more like home when you’re on stage with other people. But I’ve always come to appreciate the side of playing solo. I’m excited to put out new music and be able to play a few tours with a band again, too. MR: You’ve said that you decided to play under your name so you could have more flexibility with who you could play with. HM: Yeah. I think, ultimately, instead of playing a solo show and it being Hugh Masterson from Hugh Bob And The Hustle, that’s a lot, you know? Even when I had Hugh Bob And The Hustle, the band wanted to change the name. So we thought the easiest thing would be to change it to my name. And then when I do play solo or with a band, it’s still just one thing. Not a whole paragraph. It’s easier to remember I think. MR: Have you played with any of the members from the Hustle lately? HM: No. I actually played with two guys from Lone Bellow, one guy from this band Phosphorescent, and this other guy that plays with a bunch of different people. He’s been out recently with Wheeler Walker Jr. Brad, the keyboard player, played a couple show with us in Wisconsin. I had asked some of the other guys if they could do it but they already had things booked. In the future, I’m sure you’ll see some of those guys with me on stage again on different tours and things like that. MR: It sounds like writing these songs was very therapeutic in dealing with your mother’s passing and other life changes. How did writing these songs help you? HM: Yeah. I know you lost your father and it was sad to see that because I know that’s a hard thing to go through. You tend to look at life a different way. It becomes a lot more precious and the people that are around you become more precious. But it was also a grieving period for me, just trying to figure things out. My mom had been sick for a while so I wanted to be somewhat close to home. After she passed away, I felt free to be able to come to Nashville and try to grow and expand on my own for personal growth. But it also was a really tough time for me. At some points, I wasn’t sure I wanted to be on stage with a bunch of people staring at me. I felt like I had a lot of thinking to do, figure life out. But after time it gets a little bit easier and you learn how to navigate through life again. MR: What does the term “Lost And Found” mean for you? HM: “Lost And Found” is actually the first song that I started scribbling down. That happened when I was living in Riverwest playing in a bunch of different bands. I wasn’t singing. I was playing guitar and bass in different bands. I got mugged in Riverwest. Some kid ran up behind me and I turned around and they hit me in the head with a tire iron and broke my jaw in two places. I had to have my jaw wired shut for six weeks. I was stuck at home playing guitar and the first words that came out of my mouth when I came up with something on the guitar was “I got beat up just walking around town / Holding my head held high still on the ground.” That feeling of going through hard times but coming back out on the other side, and you may have some scars and bruises but you’re still around to talk about it. At some point, I finished that song. To me, it’s exciting to put it out there because it was the first thing that I started writing down on paper as a songwriter. MR: Is the song “Show On The Road” inspired by your travels as a touring musician? HM: I started writing that song the day before or the morning that I left. I was leaving for Nashville before moving down. I was coming down to write songs and co-write with different people. It was just something where I woke up and played something on the guitar. I know that you’ve traveled and gone hiking and stuff like that. But sometimes you feel kind of stuck, even if life is okay and you have a lot of friends. Sometimes life can get a little monotonous. So I think in some ways I was excited to venture out and do something else. The song “Leaving” is the idea of leaving negative energy behind you and trying to get something else going and trying to reshape. MR: How did you get connected with Bill at Key Club? HM: The manager we had was originally from Detroit. He was back home, he had lived in Chicago, and was traveling from Detroit to Chicago. He heard about that place and he stopped by there, and checked it out and talked to Bill and played him our tunes and things like that. And he was excited to work with us. And Benton Harbor is not a long drive from Milwaukee. So it was pretty easy to pack up and go there and hang out for the week and record. It’s the type of place where there are no windows. You’re locked in there. You just work the whole week. MR: How did Bill influence the direction of the songs? HM: Our idea for the album was to try to track as much of it live playing together instead of being in a bunch of different rooms. Only the drummer was in a different room, but we could see him through the window. The rest of us were right on top of each other in a small room. Bill just let us go. But he’s really good at recording live things and also has a particular sound with drums. He worked with Steve Albini for a long time. So he has a little bit of a Steve Albini approach to things. MR: You mentioned earlier about playing with Margo Price. What was that experience like? HM: From all the times coming down here before she got her record deal, I was friends with her and her husband Jeremy and her bass player Kevin. Kevin used to play with Sturgill Simpson. Hugh Bob played a bunch of shows with him. But I had known Kevin for a long time. So there wasn’t anyone in the band that I didn’t know. Most of them I was already good friends with. So that was easy. That was getting to hang out with a bunch of friends. I traveled with them in their vehicle. It was a good time. They were really sweet. She’s actually a really good drummer. So she would come out to play drums on my last two songs, and her husband Jeremy would play bass. That was really fun for me and also fun for the audience to see her come out and play drums. It was surprising for people. MR: Any other favorite stories of late? HM: When I was out with them, they got to play [Late Nite With] Seth Meyers so I got to go there and hang out and see all that. That was pretty cool. We got to hang out on the set for Saturday Night Live. Just a lot of things I hadn’t seen before. It was fun to be there and watch friends do it. MR: Any big surprises from the recording sessions for the EP? HM: Not really. Most of the stuff was already done. I got it mixed down here with my friend and mastered, and had some friends from down here add some other things to it that weren’t already on there. Like the horn section from the Anderson East band played horns on one of the songs, “Bigger Man.” My friend Jaida Dryer sang on “Show On The Road.” She’s a great songwriter. She’s got a number one with Luke Bryan. So she writes all kinds of songs. But she was one of the people who was lucky enough to get a number one. Not that I would ever want to put myself in the world of Luke Bryan for crying out loud. She’s a great performer on her own, so it’s nice to have her singing on that song. MR: What are your future plans? Anything big planned past the EP release? HM: Nothing at the moment. As soon as we get this release out my booking agent will be getting me out on the road opening for other people. There’s nothing locked in that I can talk about at the moment. But I’ll be doing Americana Fest. I think that’s September. And I’m going out to Newport Folk Festival at the end of July. I’ll be playing a couple sets there. MR: With your music, do you see a mix of Wisconsin and Nashville influences? HM: I would say it’s still more writing from the same spot I was in when I was in Wisconsin. Everything I know is from there. All my growing up is from there. Most of my memories are from there. Here there are a lot of great bands, but when I go out it’s a lot of honky-tonk music. Definitely the newer stuff that I’m writing, beyond what I’m putting out right now, the direction it’s going is more on the side of folk. It used to be called folk music, but now it’s called Americana. With the band, it gets kind of rocking, but it’s never too country. It’s definitely more storytelling and stuff like that. Which I feel like I’ve got from living in Wisconsin. Joshua Miller is a freelance writer based in southeastern Wisconsin. In addition to contributing to Milwaukee Record, Josh has also been published in numerous Milwaukee and Madison publications as well as national publications like A.V. Club, Paste, and Under The Radar.